The world around us is changing. What will make the first century of the millennium different to the last? What will we love, how will we live, what will keep us awake at night? Join artists, scientists, ethicists, futurologists as they explore questions, ideas and propositions that explore our changing environment and the challenges humanity faces in the future. 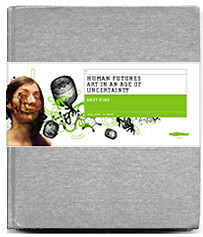 This conference brings together contributors from FACT’s Human Futures: Art in an Age of Uncertainty edited by Andy Miah which features work by George J Annas, Fiona Raby & Anthony Dunne, Norman M Klein and William Sims Bainbridge and Oron Catts.